Humberto Gomez invited you to Andrew Janz ‘s event Orange Cove Democratic Block Party Sunday, September 16 at 2 PM James Eaton Park in Orange Cove, California Going Interested Not Interested Join us for a block party in the heart of Orange Cove on September 16th and meet the candidates running for office in our district. 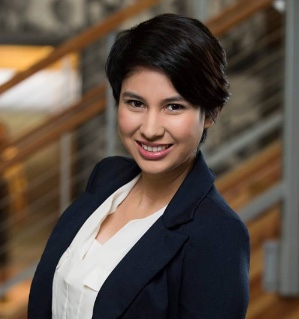 Candidates include Andrew Janz, Melissa Hurtado and Magdalena Gomez,… Humberto Gomez and 2 others are going. Pending Invites (10) Block invites from Humberto? Humberto Gomez and 2 others are going. 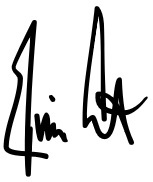 Jerry Brown Signs Our Climate Bill! I’ve got some breaking news for you — Governor Jerry Brown just signed my clean energy bill, SB100, putting California on a path to 100% clean energy by 2045. I’ve got some breaking news for you — Governor Jerry Brown just signed my clean energy bill, SB100, putting California on a path to 100% clean energy by 2045. This is historic because there is no economy larger in the world that has committed to pure clean energy. It’s an ambitious goal that will require hard work, but as Governor Brown said, California will lead the way. We won’t wait around for Washington D.C.to do the right thing..
Today is a day that reminds me why I got into public service. To push hard for what you believe is right, to protect this beautiful state and all its inhabitants without compromising on the things that really matter. The environment really, really matters, and California just renewed its leadership in the world because of our efforts. That’s why I’m asking you to make a contribution to my senate campaign. Because I know that California needs to lead by example, and elect an unapologetic progressive who will go to the mat for what really matters: climate change, Medicare for All, a $15 dollar minimum wage, immigration reform and an America whose policies are rooted in the notion that everyone deserves a fair shot at success. Can you pitch in $25 today and help power our campaign? I don’t want to just run as the “progressive” in the race against Dianne Feinstein, I want to explain why I believe progressive values and political smarts can accomplish big things for California and the nation. This bill, SB100, took years of work to pass. There was all kinds of opposition and it looked like it was dead in the water more than once. It could have been significantly easier had we watered it down, compromised, and caved to special interests and campaign donors with giveaways and freebies. But that’s not what California needs. California needs to lead the way on transitioning to a 100% clean energy state by 2045 — full stop. So that’s what we fought for, not because it was easy, but because it was necessary. We choose to go to the Moon. We choose to go to the Moon in this decade and do the other things, not because they are easy, but because they are hard; because that goal will serve to organize and measure the best of our energies and skills, because that challenge is one that we are willing to accept, one we are unwilling to postpone, and one we intend to win. We choose to push for the most sweeping reinvention of our electric grid, and power sources not because it is the politically convenient thing to do or because it is easy, but because it is necessary, and California doesn’t shy away from a challenge that has a greater good for all. I’m asking you to pitch in and donate to my campaign, because Washington D.C. needs senators who will fight tooth and nail to protect our climate. Chip in $25 today and let’s power this campaign (with clean energy) all the way. President Obama just held his first big campaign event of the midterms — right here in California — to help Democrats win back the House in November. President Obama made an important point this Saturday: “If we don’t step up now, things can get worse.” It’s not just crucially important that Democrats retake the House — we need to elect leaders who are going to put their communities front and center in Washington. Tony Delivers on For-Profit Charter School Ban! Tony has already delivered on a campaign promise well before Election Day! Governor Jerry Brown signed legislation Tony co-authored to ban for-profit charter schools in the state of California. AB 406 will directly affect companies like K12 Inc., a for-profit virtual charter school company listed on the New York Stock Exchange that reported nearly $900 million in revenue last year. Many complaints have been brought against K12 Inc. in recent years by its own teachers, resulting in a multimillion-dollar settlement with the state of California. Tony believes no one should profit off of our students, but he’s not just talking, he’s taking action. With the election only 57 days away, you can help Tony beat the billionaires seeking to privatize public education by donating today! Be sure to help spread the word by sharing Tony’s Facebook post and retweeting his tweet about Tony successfully banning for-profit charter schools throughout the state of California. Games, Free Food, Activity Booths, DJ Entertainment & a Movie in the Park! 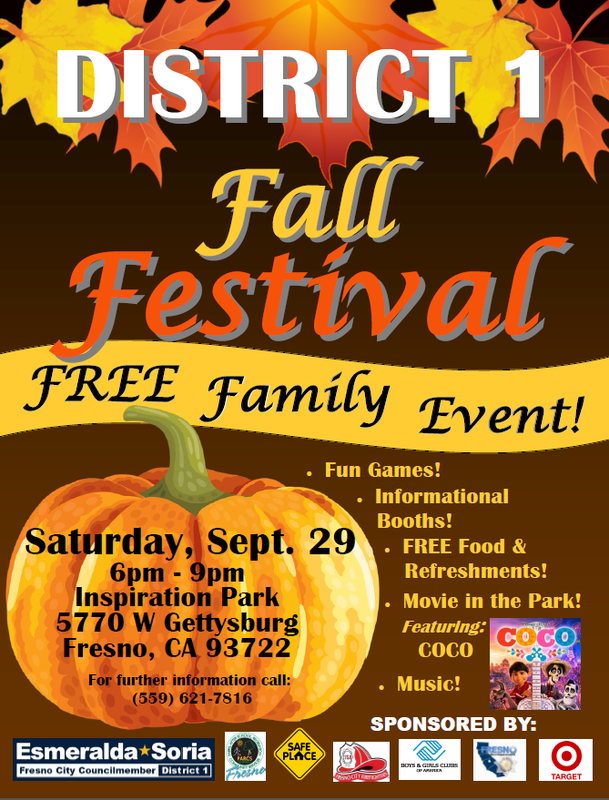 We are happy to announce that the first ever District 1 Fall Festival will take place this year on Saturday, September 29th at Inspiration Park! This is response to having to cancel our National Night Out event due to bad air quality reports showing hazardous conditions for our Fresno residents. We sincerely thank you for your understanding and hope you will join us for this great event! Let’s Help Veva Win this Election! I love Fresno, it’s the place where my parents met, where I was born and where I was educated. I’ve worked in Fresno for many years, I’m invested in making my community a better place to live for everyone. 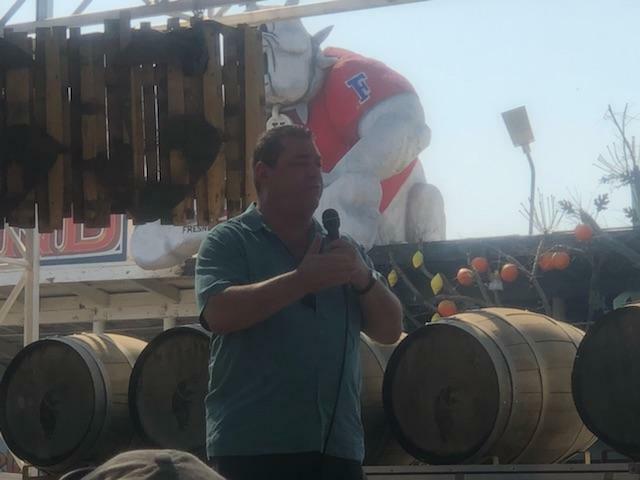 I’m very conscious of the role Fresno plays in shaping the political landscape of the Central Valley and the State of California. I think you’ll agree that if we want good leaders in government, we need to help them win seats in 2018. Shaping our future political landscape starts with supporting local leaders down ticket. I’m asking for your support by donating to my campaign and helping me win this election. I’m running for Trustee of Fresno Unified School District because I believe that a great community is made better by ensuring that every child receives a great education. Many children in my community are falling behind. I want to make sure that we are aligning our priorities and resources to help ensure that children from disadvantaged families have the attention and resources they need to break out of the cycle of poverty. I want children of color to have greater opportunities to go to college than to prison. I want the young women of my community to be empowered with an education that will help them break every glass ceiling they’ll encounter in reaching their highest potential. I want all children regardless of their gender or sexual identity or immigration status or religion to know that they are welcome and that they belong. I’m a child of Mexican immigrants. 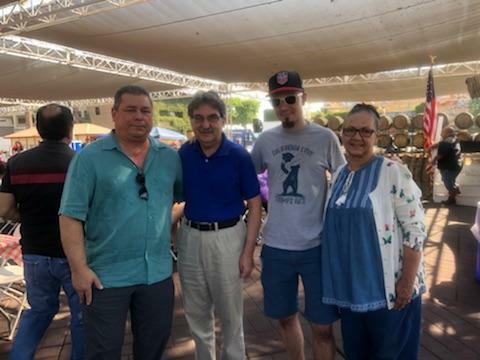 My parents labored in the fields of the Central Valley as farm workers to ensure that their children would have better opportunities than they had. I am the first person in my family to graduate from a University. I am proof of the transformative power of education. This is my hope for every child in my district – that they too will have the opportunity to achieve their dreams. All of our children should benefit from a school system that prioritizes their education, that ensures that their teachers are well equipped to give them a quality education and that invests in tools, technology and facilities that create the best environments for learning in today’s world. There is so much we need to work on to make our school system better. I’m committed to working on behalf of the students and families of my district. With your help, I will win. To donate, please click the donate link below. Donations in any amount are valued. Thank you for your support. This week was full of reminders that women’s constitutional right to reproductive health care is still under attack — and I’m doing everything I can to hold the line. Right now, anti-choice state lawmakers are trying to criminalize abortion in certain cases — a move that violates decades of Supreme Court rulings. So I led 18 Attorneys General this week in weighing in to support women’s reproductive freedom and uphold the rule of law. Supporters like you make it possible for me to fight back whenever women’s health and rights are threatened. Can you chip in $5 to my campaign now to help me keep up the fight? I also signed on to oppose a new state-level law that would restrict health care providers that offer abortion services — like Planned Parenthood — from receiving public health funding. It’s a move that would cut off funds for crucial programs, like breast cancer prevention and support for survivors of domestic violence. I firmly believe every woman should have the right to make her own decisions about her body. I won’t ever back down until that right is fully respected. State Attorneys General like me are on the frontlines of this fight. Can I count on you to pitch in $5 now to help me keep fighting for women’s health and rights? It’s been a long, depressing, Obama-less 19 months. But that all changes tomorrow, right here in California. President Obama returns to the campaign trail in Orange County where he will headline an event featuring CDP Chair Eric C. Bauman and many of the Democrats running to retake the House from Republicans. The fact that President Obama is choosing California as the first place to campaign shows just how crucial our state is to the Country’s future. And the news of his visit has electrified Democrats from Siskiyou to San Diego. 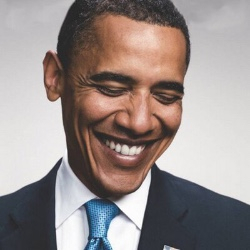 The greatest president of our lifetime – someone who expanded healthcare to tens of millions of people, and who never, ever denigrated anyone – is fighting for a progressive, Democratic Congress, and that should terrify Trump and the Republicans. 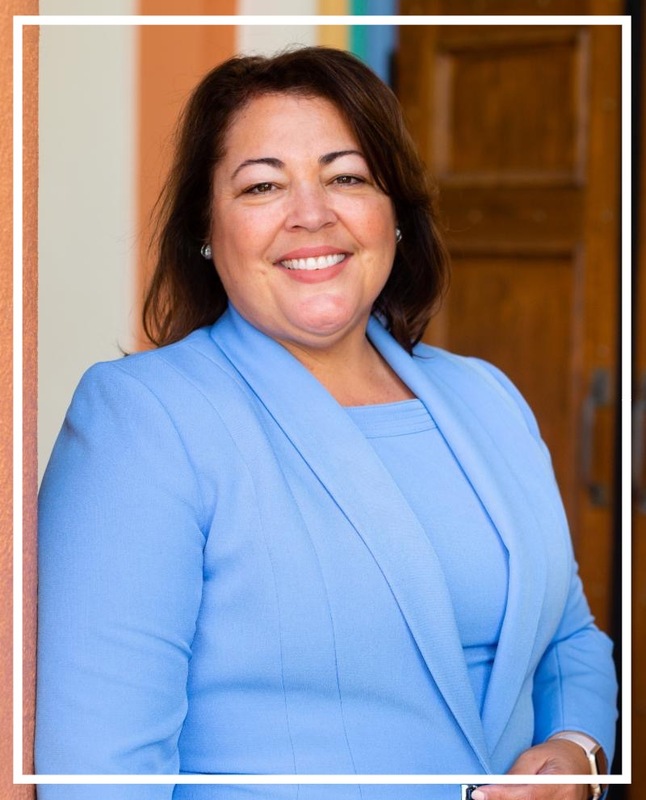 Your CDP Team was delighted to learn this week that our former colleague, Candelaria Vargas, won the San Joaquin County Democratic Party endorsement in her campaign for Stockton Unified School District. Candelaria was a longtime member of the CDP Communications team before taking her current position at DailyKOS. But like every good candidate, it’s her life experiences and accomplishments that make her the best choice for Stockton’s students – from foster care to high school valedictorian, and then to college and post grad, she understands how hard life can be for some students, and what it takes to make sure those kids have a chance to succeed. We’re so proud that our former colleague has joined the ranks of amazing, young Women of Color seeking office this year, and we wish her the best of luck in November! Find out more about Candelaria Vargas by visiting her website, and click here to make a contribution. 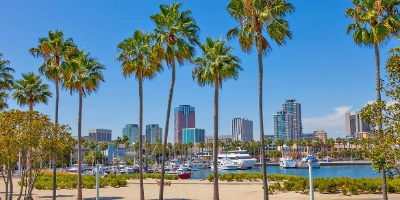 The California Democratic Party Executive Board will be meeting the weekend of November 16-18 in Long Beach. Registration and the hotel block are opening soon – be on the lookout for our email shortly. Chair Bauman spent Labor Day with the hardworking folks of the Fresno-Madera-Tulare-Kings Central Labor Council at their Labor Day event, as did Andrew Janz, one of our great Democratic candidates mounting extraordinary challenges to entrenched Republican incumbents, and Assemblymember Anna Caballero, who’s fighting hard to capture a crucial Republican seat in the Senate. Labor day is more than a celebration of working people – it’s also a celebration of the Labor Unions that working people rely on to fight for their rights and ensure they get the fair pay, safe working conditions and dignity they deserve. The Labor Union movement is unquestionably under attack – the Janus decision was the latest salvo in an assault that began with the Air Traffic Controllers more than 30 years ago. As Democrats, we are committed to standing with our compatriots in the Labor Movement, and break feverish anti-Union, anti-working people mentality in Washington D.C. Chair Bauman and Your CDP Team have put the finishing touches on our campaign plan for the fall, and it’s time to put that plan into action! We’re hiring several positions across the state for the November 2018 General Election – Please check out our Employment Opportunities page and forward to any interested contacts. 60 Days Until the Election! 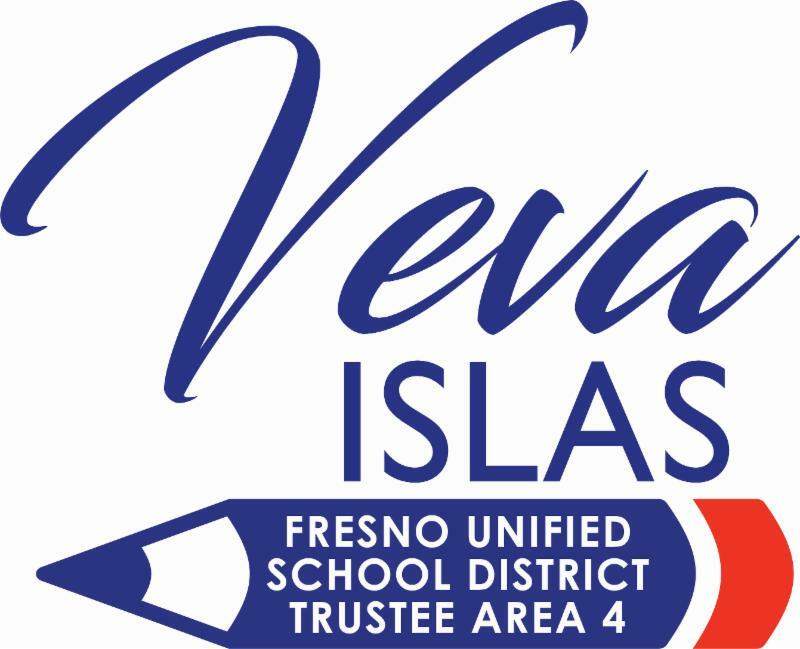 Genoveva Islas invited you to Veva Islas for Fresno Unified School District ‘s event Campaign Launch – Veva Islas for FUSD Trustee Area 4 Thursday, September 20 at 6 PM 1361 N Hulbert Ave, Fresno, CA 93728-1141, United States Going Interested Not Interested Join friends of Veva Islas as she kicks off her campaign for Fresno Unified School District Trustee Area 4. Tickets are $50. Sponsorship opportunities include $100 Friends, $500 Supporter, $1,000 Co… Pending Invites (12) Block invites from Genoveva? Joaquin Arambula invited you to Dr. Joaquin Arambula for Assembly ‘s event Campaign Kickoff and TACOS Saturday, September 15 at 5 PM Address given upon RSVP Going Interested Not Interested Please join us for a Campaign Kickoff, La Jacka taco truck fiesta at the home of Dr. Joaquin and Elizabeth Arambula. RSVP to Maria at (559)360-2946 or maria@joaquinarambula.c… Jewel Hurtado and 10 others are going. Pending Invites (11) Block invites from Joaquin? Jewel Hurtado and 10 others are going. Voting rights are under attack. From Trump’s nomination of Kavanaugh to the Supreme Court to the Republican Congress blocking election security funding to the Trump Department of Injustice and their intimidation tactics in North Carolina, our efforts to elect Democratic secretaries of state nationwide are increasingly urgent and important. You can help. READ this week’s top stories about election security and the GOP voter suppression efforts. And please SHARE these stories with your friends. TAKE ACTION: Tell Congress to increase election security funding NOW! HELP PROTECT VOTING RIGHTS: Become a 2018 Founding Member of our Protect The Vote Project and help us fight back against GOP voter suppression! In 2016, California’s 21st district rejected Trump by a wide margin. He lost here by 16 points! So why do we have a representative in Congress who votes with Trump 99% of the time? Time and again, Valadao has proven that he’s willing to put Trump and his special interest donors ahead of the people he’s supposed to represent. The votes that Valadao has taken over the last two years — especially to repeal health care — are disastrous for the Central Valley. We deserve better than a rubber stamp for Trump’s agenda. It’s time to send Valadao packing. Can you chip in to TJ’s campaign so we can defeat Valadao and bring real representation back to the Central Valley? 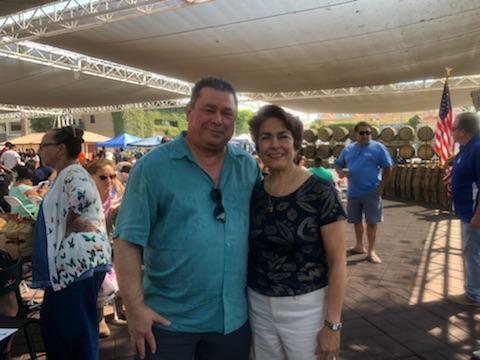 Let’s get Phil Arballo elected to Fresno City Council in 2020!